I am a very enthusiastic Tacoma owner, I used to manage Tacoma Magazine, and even learned how to drive over thirty years ago in a Toyota Corolla. With that said, I had some seriously high expectations for this new Tacoma. For the most part, the Engineering team stepped up to meet or beat most of my desires. During the test drive we got to experience both on and off-road characteristics and I have to say that the 2016 Tacoma is not the same old truck. With the new refinements to the Dash and more impressively the Instrument Cluster, this is “starting” to look like a modern first-in-class representation. Then they tuned up the suspension and beefed up the drivetrain and it feels like first-in-class. Finally you have the engineers putting a nice little bow on this holiday package by trying to be like no one else and creating a family feel across market segments. By sharing front end stylings and body lines with both the Tundra and the 4Runner the engineers pay homage to the winning qualities from the rest of the family. The drive on-road was a welcome surprise…the truck felt tight in the corners with little to no understeer and much less body roll than ever before. The Tacoma is only a little bit quieter then before, however, it is now more structurally complete and a lot safer than previous generations. The Engineers went so far as to redesign the seats and the rest of the interior to give more leg room and help give a much more comfortable ride. The off-road performance was equally impressive. This was the first time that I truly experience the full power of the Crawl Control and it was very impressive to see what Toyota has done to create a more capable vehicle. You have all seen the video by now, if you have not, Toyota buried a Tacoma up to the frame in the front and rear in sand, turned on the Crawl Control, and the truck walked itself right out of the sand. The issue I do have is that you do not put your feet on the brake or gas and the truck will go up and down better than a 40% grade under its own control. I do not know about you, but I tend to need that control for myself and with the decent the braking system is far from quiet while the system is constantly moving braking power between all four tires. 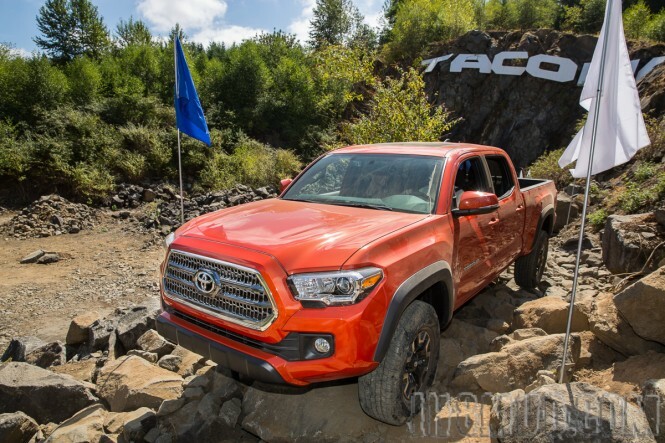 With the creation of the TRD Pro, Toyota has been on a suspension bender and this new generation of Tacoma is reaping the rewards of their research and efforts. For a stock truck it was quite impressive, that is for sure! Say you love it or you hate it, it really does not matter. The redesign is done, it is what it is, another fantastic Toyota, and it is the best Tacoma yet. The new Atkinson Cycle engine will have to prove itself and if you do not like the cosmetics they will grow on you (and you know it). The interior is a much needed update, finally bringing the Tacoma up to date with styling and technology. I, for one, love it, I love the new ride and more power, I thoroughly enjoyed the comfort and new technology, and I even like how the Engineers are starting to tie the family of vehicles together with similar body lines and features. The one main down side to the redesigned Tacoma is the grill. It is going to be a pain for the aftermarket to come up with a way to replace the front bumper and I am not sure if that was the intention or not. I am looking forward to getting a 2016 Tacoma here in Colorado to see how it handles at altitude and with a payload. We will let you know how that goes really soon! Until then, Stay the Trail and Tread Lightly!